In this related question, it was explained that the differences in design between a Mars rover and moon rover were too substantial to substitute one for another. One of the points made was that the airbag landing system is not viable for moon landings. Why is this? I understand that the airbag landing system is typically accompanied by a parachute in an atmosphere. Is it viable to perform a slow approach and then deploy airbags for landing on the moon's surface? Why or why not? During the Pathfinder landing the airbag system hit the ground at about 20m/s. This seems fast but compared to other space speeds, it's very slow. When the pathfinder rover arrived to land at Mars, it was cruising at around 7300m/s. To get this velocity to zero, the parachutes, heat-shield, and single-fire rocket engine did their work to kill the velocity around 12 meters above the surface where the airbag-covered lander was dropped. For a lunar mission airbags don't make a lot of sense, because there's no real way to lose speed besides a rocket engine (drag is virtually nonexistent). In order to kill the velocity of the moon's orbit, you need propulsion. Now, if you've already got a functional rocket engine and enough fuel to bring the velocity at landing down to something an airbag could handle, say 20m/s, all the extra mass required for an airbag system would outweigh the minuscule amount of fuel required to kill that last bit of velocity in the weak lunar gravity. Actually there’s no reason that an airbag system could not be used on the Moon, nor that it could not be a good design decision in some circumstances. The MPF and MER airbags took out the last 10 to 26 m/s of velocity. The reason that there was that much velocity left was the accuracy, or inaccuracy of the solid rocket motors’ total impulse, along with uncertainties from the low-cost radar altimeter and consequent timing of the ignition of the motors. The use of solid rocket motors made for a mass-efficient (very low dry mass) and low-cost approach, but with the penalty of an air bag stage that had to follow it. I could easily imagine the same situation for a lunar landing. You might decide to use a large solid rocket motor to take out nearly all of the approach velocity of, say, 2 km/s, for cost and mass reasons. I would expect 0.5% or so total impulse accuracy, so about 10 m/s residual. Hey, look at that! That’s right in the range that an airbag could handle. 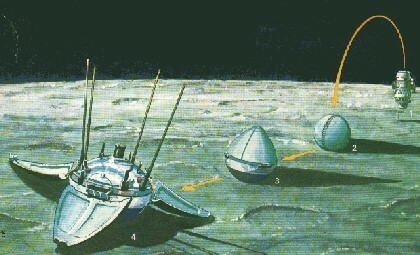 Early Soviet Lunar probes such as Luna 9 did use airbags. I do not have a reference, but suspect the design process was as per Mark Adler's answer where the state of the art could get a controlled crash (wiki lists 6m/s) but not a soft landing. A book by one of the Sojourner team mentions assistance from the Russians during the design stage for the landing method but not what that meant. Given improvements in control systems and simulation, I suspect that it would be a very odd set of design constraints that made airbags the best choice for a new build Lunar lander. Maybe to deploy cubesat-sized sensors from a parent craft during final approach? Not the answer you're looking for? Browse other questions tagged the-moon landing lunar-landing air-bag or ask your own question. Where should a lunar polar ISRU mission land? Olympus Mons - viable Mars landing site? Why did the Apollo Lunar Module have four landing legs? How would vertical landing scale with size - does bigger = “easier” (actually)? When Chang'e-3 landed on the moon, did LADEE notice?